Founded in 1898 as the Morgan Athletic Club, the Arizona Cardinals have competed in the National Football League (NFL) since 1920. As part of the National Football Conference (NFC) West Division, currently, the Cardinals have won two NFL championships with one Division Championship and seven Conference Championships. And now, all ready for the 2018-2019 season, the Cardinals are back and have their sights set on bringing a home a Super Bowl trophy. Led by a shut down defense and a highly skilled offense, Arizona is ready to take on and conquer the competitive NFC West. Division rivals, the San Francisco 49ers and the Seattle Seahawks will look to halt the Cardinal's aspirations. Grab your Arizona Cardinals tickets and head over to the Univeristy of Phoenix Stadium and be a part of your teams' much needed home field advantage. The 2006 Chicago Bears vs. Arizona Cardinals Game – “Monday Night Comeback” - The game that took place on October 16, 2006, during the sixth week of the NFL season at the University of Phoenix Stadium set many records. The Chicago Bears defeated the Cardinals 24-23 in an epic encounter. This was the first game in which the Bears were victorious after trailing by 20 points or more since 1987. The Cardinals became the first team in the history of the NFL to lose back to back games in a season after having a 14-point lead at the end of the first quarter. The Chicago Bears also set the record for the biggest comeback without scoring an offensive touchdown. The record-setting game also saw the Cardinals’ quarterback Matt Leinart become the first quarterback to throw at least two touchdown passes in both of his first two career starts. Arizona Cardinals vs. Buffalo Bills - “One Hand Miracle” - Taking place in the Week 3 of the 2016 season, the game between the Arizona Cardinals and the Buffalo Bills gave football fans with one of the most epic plays ever. The Arizona side got off to a slow start and fell behind the Buffalo Bills, 10-0, through the first quarter. Even though the Cardinals wound up losing the game, 33-18, it was a moment of pure brilliance by Patrick Peterson that made headlines. As Tyrod Taylor from the Bills threw a deep ball early in the second quarter, Peterson dived and made a one-hand interception down the sideline before going out of bounds. The biggest rivals of the Arizona Cardinals are without a doubt,the Seattle Seahawks . The Seattle Seahawks have played against the Arizona Cardinals a total of 36 times, out of which the Cardinals have lost 17 times and won 18 times, with 1 game tied. With both teams being equally good and in the same division, it is not hard to imagine that they would have an intense rivalry. This rivalry began at the end of 2013 season, when the Cardinals hired Bruce Arians and traded for Carson Palmer. Their season record of 10-6 included a rare 17-10 victory against the Seattle Seahawks in Week 16.The Seahawks managed to win against the Cardinals in 2014 without Palmer, but when Palmer returned to the Cardinals’ side in 2015, the Arizona team roared to the top of the NFC West. This run included a 39-32 comeback win over rivals, Seattle. With the 2018 season right around the corner, the two teams still happen to be among the favorites for Super Bowl, intensifying the rivalry more. The Cardinals have had quite a few big names on their roster, over the years - Jake Plummer being one of them. The quarterback graduated from the Arizona State University and was drafted by the Cardinals in the second round of the 1997 NFL Draft. He has thrown more than 15,000 yards for the Cardinals and helped the team achieve an epic win against the Dallas Cowboys, 20-7, the franchise’s first playoff win in 51 years. Another big name from the Cardinals’ side is wide receiver, Roy Greene. He tallied 2,597 receiving yards during his time with the team, along with 18 touchdowns. Darnell Dockett, the Defensive End selected by the Cardinals in the third round of the 2004 draft managed to rack up 36 sacks, four interceptions and seven forced fumbles during his time with the Arizona Cardinals. Located in Glendale, Arizona, this 63,000 seat stadium provides Cardinals fans with a unique game-day experience. University of Phoenix Stadium features the first fully retractable natural grass playing field in North America. The stadium also features a mural on each level. Each mural is designed to represent Arizona's environmental attractions and representing the history of the Cardinals with murals depicting Arizona greats. The Cardinals are all geared up to make an impact in this season, being one of the favorites in their division. Their first regular season game will be played home at the University of Phoenix Stadium, in Glendale against the Washington Redskins. If you want to enjoy the latest season of the Arizona Cardinals, you need to keep an eye out for Arizona Cardinals tickets 2018-2019. Our process for purchasing cheap Arizona Cardinals tickets is simple and fast. There are so many online ticketing sites, that it can be hard for customers to find the right place to buy Arizona Cardinals tickets at the cheapest price. At ScoreBig we think of our customers first and foremost. We offer daily deals for Arizona Cardinals events, so our customers can get the best seats for the best prices. ScoreBig will always go above and beyond to offer the cheapest Arizona Cardinals tickets on the market. The Arizona Cardinals schedule above, displays all available events for 2019 and 2020. Once you find the event that you would like to go to, click the red “Get Tickets” button. It is located on the right-hand side of the event listing, it will take you to an Arizona Cardinals event ticket page. ScoreBig's event ticket page will display all available Arizona Cardinals tickets for that event. On the event ticket page to help with your search for the right Arizona Cardinals tickets, use the filters at the top to select quantity, price range, and more. There is also an interactive seating chart so you can pick where you want to sit. When you are ready to buy a ticket, click on the listing, and you will be directed to ScoreBig's checkout page. Upon completion of the information fields, your order will be processed and your Arizona Cardinals tickets will be delivered via email, mail, or to your mobile device. What makes ScoreBig’s site stand out from the rest? We are constantly analyzing our competitors to improve our site, service, and prices. ScoreBig.com employees strive to offer the best process and experience to buy cheap Arizona Cardinals tickets. Our goal is to get you the best seats to Arizona Cardinals events. We offer daily discounts on our site and for special promotions check out our newsletter. If there are no Arizona Cardinals events currently available, you can use our search feature at the top of the page to see a list of all popular events going on near you. No matter your price point, we have all the best deals and discounts on Arizona Cardinals tickets. For more information on prices of Arizona Cardinals tickets and the schedule for Arizona Cardinals, check out our listings above. The last thing you want to find out is when the Arizona Cardinals event you wanted to go to is sold-out. Don’t worry in many cases ScoreBig has affordable tickets to sold out events. We sell tickets from GA all the way to premium seating and parking. Skip the scalpers in the parking lot and get your tickets online from top Arizona Cardinals ticket brokers. We get you in all events, buy your Arizona Cardinals tickets here from a brand that many trust and rely on for all their ticketing needs. ScoreBig offers a 100% money-back guarantee. If you have been in search of cheap tickets for Arizona Cardinals, ScoreBig by far is the best option. That’s why ScoreBig has more loyal customers than any other ticketing site. 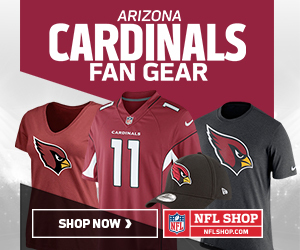 Shop at ScoreBig for safe and secure Arizona Cardinals event tickets.